Our feline friends are often surrounded by a lot of mystery and myths. From superstition and death-defying nine lives to whether they're colour blind and lactose intolerant, people across the world believe many weird and wonderful things about cats. To help you sort truth and fiction about our four-legged-friends, we've created a mythbuster covering all the big questions. Although you may hear it the most around your home, the meow isn't like other feline sounds. The shrill hissing and spitting of a fight or a high-pitched mating scream is a far cry from an adorable little meow. Experts have gone as far to say that the meow is actually a product of living with humans. The sound of a cat meowing can be associated with the cry of a human baby, immediately triggering a nurturing reaction in us. So when they're meowing, our automatic reaction is to look after our furry friends, and whether that's giving them food or a cuddle, it gets results. There is a common thought, that compared to dogs, a cat has quite an indifferent attitude, so the question is - are cats loyal? Experts have said that our feline companions are more independent than dogs, and don't necessarily need their owner to feel safe. However, that doesn't mean they don't need attention. A cat wouldn't be happy and wouldn't stay in an uncomfortable home. Cats are solitary creatures and they may not be as forthcoming with their affection as their canine friends, but they do enjoy rubbing along happily with their family, even if they're not always up for a cuddle. When you think training, dogs pop to mind - but cats can be trained too. Similar to their canine buds, they need a lot of positive reinforcement, some motivation in the form of treats and a little patience from you. Aim to teach them one thing at a time, keep your verbal commands simple and they should master a few tricks relatively easily. Cats are intelligent creatures in comparison to the rest of the animal kingdom. When put to the test they can learn a range of commands and their long-term and short-term memory is excellent. However, although your cat won't be happy to hear it, it turns out dogs come out on top in this instance. Dogs have around twice as many neurons in their brain than cats, which is a pretty good indicator that our canine friends are the smarter species. Find out more about the dogs vs cats argument here . Although our feline companions don't have the same sensitivity to light as we do, they aren't completely colour blind. Scientists believe their colour vision is limited and they don't see the same variety of shades and hues as humans. Despite this, their vision is excellent. They have a 200-degree field of vision, compared to our 180, and their peripheral vision is fantastic. But without a full spectrum of colours, can cats see in the dark? As creatures who like to prowl around at dawn and dusk, they need excellent night vision. They have up to eight more receptors in their eyes which are sensitive to low light. Although they may love the taste, most adult cats are actually lactose intolerant, which means milk should be avoided at all costs. Unfortunately, they can't process and digest the lactose in the milk, which can sit in the gut causing stomach upset and pain for your feline friend. Although very young kittens do drink milk, it's the milk that comes from their mother - or specially formulated kitten milk if that's not available. Black cats have a bad rep. The rumour goes, if one crosses your path you're in for some bad luck. However, these furry felines weren't always a symbol of fear and suspicion. Way back in ancient Egypt, all cats, including black cats were worshipped and considered the most sacred of animals. 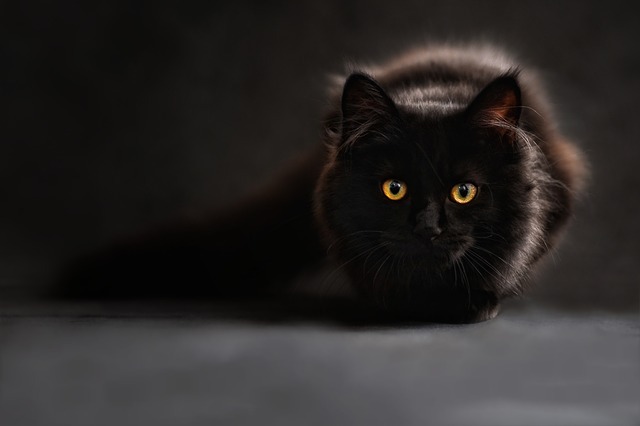 However, because they like to prowl around at night occasionally, cats were linked to witches and supernatural forces across Europe and America - probably the source of the rumour that they magically have nine lives - and black cats were often picked on because of their colour. Cat shelters are also having a hard time finding owners for black cats - not because of their association with witchcraft, but because they don't show up well in selfies! Find out more about cats with Everypaw - including the real cost of owning a cat, and buying a kitten. And just in case your cat thinks it's got nine lives, opt for cat insurance with Everypaw and be prepared for anything your feline friend gets up to.